The National Center for Educational Statistics (NCES) just released its Integrated Postsecondary Education Data System (IPEDS) report and data on postsecondary enrollment in the US for the Fall 2016 term. 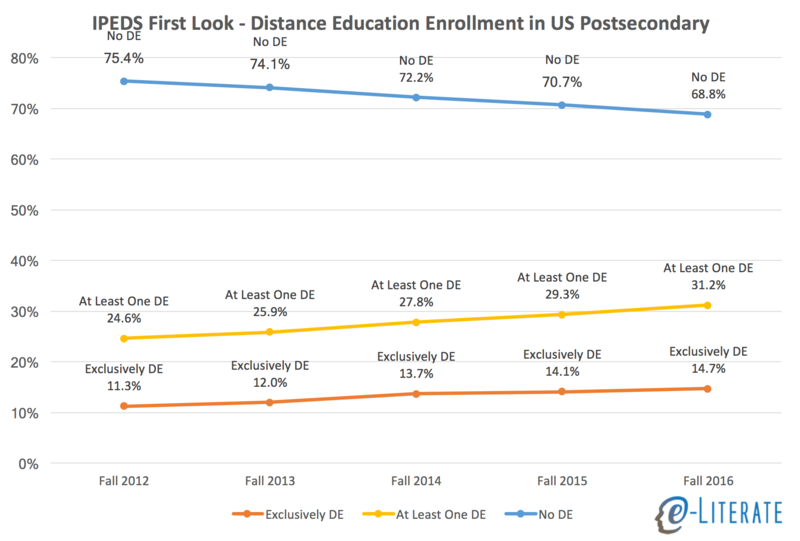 This federal data has been tracking distance education (DE) since Fall 2012, and with the new release we get our first look at trends through last year. Accompanying the data is a report by NCES with summary data tables. For the following tables and chart, I took the same approach as the report, by simply filtering for US-only institutions participating in Title IV federal financial aid programs. Please note that this is a broader definition, with more schools included, that our previous analysis at e-Literate and the Digital Learning Compass report. Those posts and analysis further filter for 2-year and 4-year degree-granting institutions. For the most part distance education and online education terms are interchangeable, but they are not equivalent as DE can include courses delivered by a medium other than the Internet (e.g. correspondence course). Exclusively DE means students who take all their courses online. Some DE means students who take some but not all of their courses online. At Least One DE is a combination of the above two categories, showing students who take at least one of their courses online. No DE means students not taking any online courses. The data totals used in the report are slightly off (0.07%) from what is in the data set that is the basis for my tables and chart below. I have not figured out this discrepancy yet, but it is immaterial for the big picture. For this first post, I am showing totals - institutions in all sectors, and a combination of student enrollment from graduate and undergraduate (4-year, 2-year, and less than 2-year) programs. I'll break down by sector and level of study and even state in future posts. With all those caveats in mind, here are data from Fall 2012 through 2016. There appears to be an small but noticeable acceleration in the growth of DE, going from 1.5% increase in percentage of students taking at least one online course from Fall 2014 to 2015, and a 1.9% increase from Fall 2015 to 2016. Although not shown in these tables, the acceleration appears in both undergraduate and graduate programs. In the four-year period from Fall 2012 to Fall 2016, the share of students taking at least one online course increased by 27% (from 24.6% to 31.2%). Note that this broad view of students (US, Title IV as only filters) does not capture the decrease in total enrollment shown in other IPEDS reports or National Student Clearinghouse reports. We'll look deeper into the data and apply more consistent filtering to allow comparisons to our previous analysis. And we'll break down by level of study, sector, and home state of institutions.